This title should probably be amended to “Ways to Decorate Any Space on a Budget” but today, I specifically wanted my 30-something year old self to give some advice to my former 22-year old self. 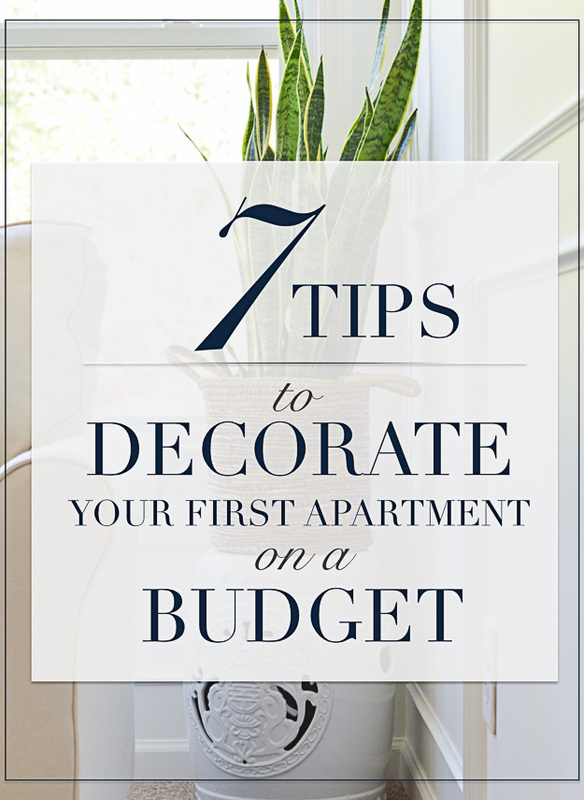 So, seven ways to decorate your first apartment on a budget, it is! After graduation, I followed my mom from Virginia down to lower Alabama and started pounding the pavement, looking for my first “big girl” job – my introduction into “the real world”. Ultimately, rural Alabama in 2008 wasn’t quite ready for me and I had to broaden my search. During a visit to Georgia, where I grew up, I sent some resumes, and was able to line up some interviews in Atlanta. I excitedly accepted my first offer – a low-paying entry-level position – drove back to Alabama to pack my bags and a week later, headed back to the suburbs of the city. I had a small, one-bedroom apartment 45 minutes north of Atlanta with rent that was about 50% of my take-home pay. I went out with friends but I also got really creative with my meals. You guys- my favorite poor girl “recipe” was white rice topped with frozen broccoli, some shredded cheddar, with a Chick-Fil-A sauce packet mixed in. Another go-to was taking a can of corn and a can of green beans, mixing them together, and then eating half for lunch and half for dinner. I did have almost every color in Nine West pointed toe pumps, so… there’s that haha. Today, we’re talking about some things I’ve learned since then – through trial, error, and new discoveries. 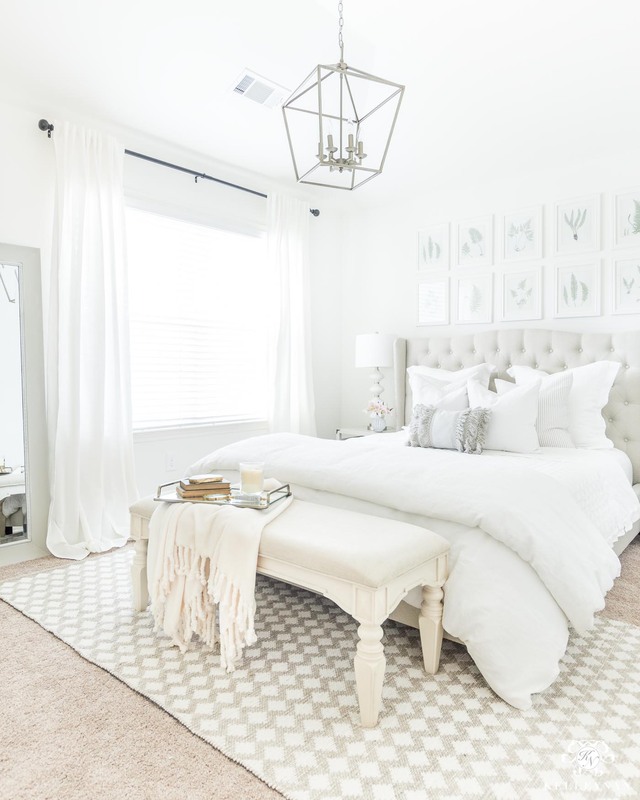 Whether you are decorating your first apartment or you’ve been on your own for 30 years, here are a few of my favorite budget-conscious ideas to create a beautiful living space. I don’t know where these have been all my life but it wasn’t until we moved into our current house that I discovered the best, almost-linen, neutral curtains. We had a ton of windows and I was looking to get the most bang for our buck; these look SO much more expensive than they are! Another plus- they come with back tabs so if you’re like me and don’t care for the pole-pocket look, these have a built-in solution. They come in different sizes (starting at 96″), and will only run you $42 for a pack of two (less if you order two sets) – plus free shipping on Amazon Prime (HERE). You can see my full post on them (yes, they’re that good that they got an entire post) HERE. 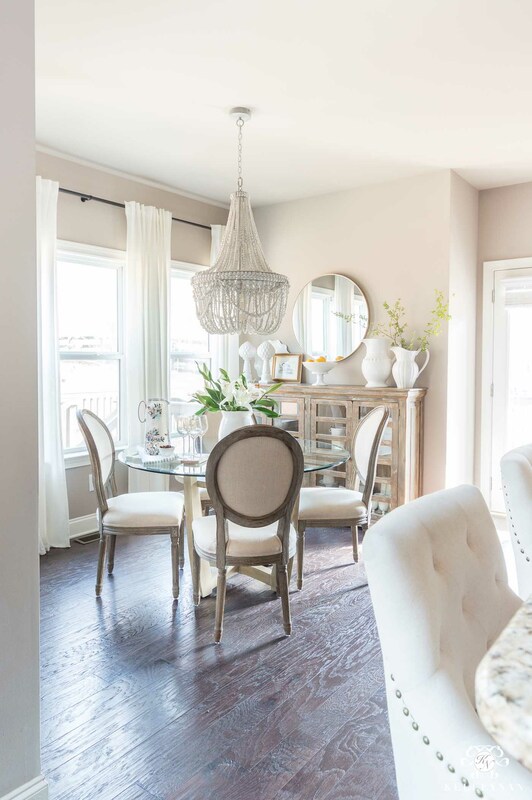 See them in our dining room and breakfast nook below. I’ve been talking about these a lot recently but you guys, I swear, having indoor plants that require little maintenance that I haven’t killed has done a ton for my esteem and decorating possibilities. My younger self would have seen a corner and thought it needed to be filled with a floor vase and whimsical branches (maybe with small mirrored circles on the ends?! ); but I’m here to tell you – forego that thing from Kirkland’s that you just see as something to fill space. Bringing in a few strategic plants is not only inexpensive, but they don’t go out of style. 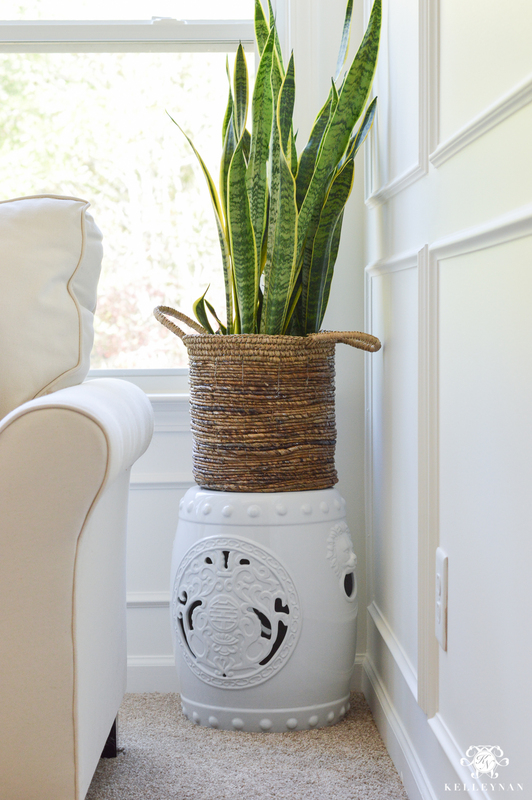 You won’t find yourself hoarding them in the basement of your home one day, either 😉 Even if all you have is some furniture and a plant, your space will look more polished. Along with live greens, take a look at garden stools instead of plant stands or side tables… which brings me to #3. 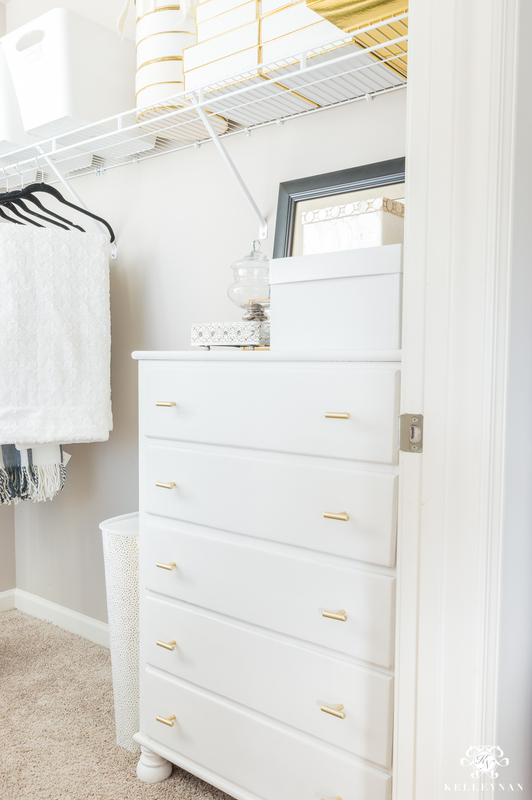 Pieces that are multi-functional can be your best friend when you’re on a budget, space confined, or even when you’re just looking for the practicality (ahem- justification 😉 ) in any purchase. Those garden stools I mentioned? 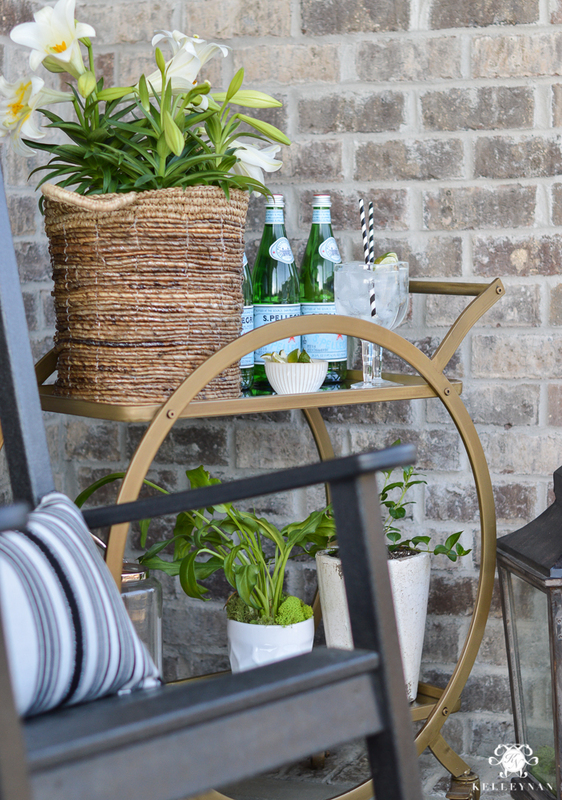 They can serve as plant stands, side tables, and seating… Bar carts are my favorite. If you are thinking you barely have enough room for a side table and there’s no way you would even consider bringing in an “extra” like a bar cart, here’s the answer. 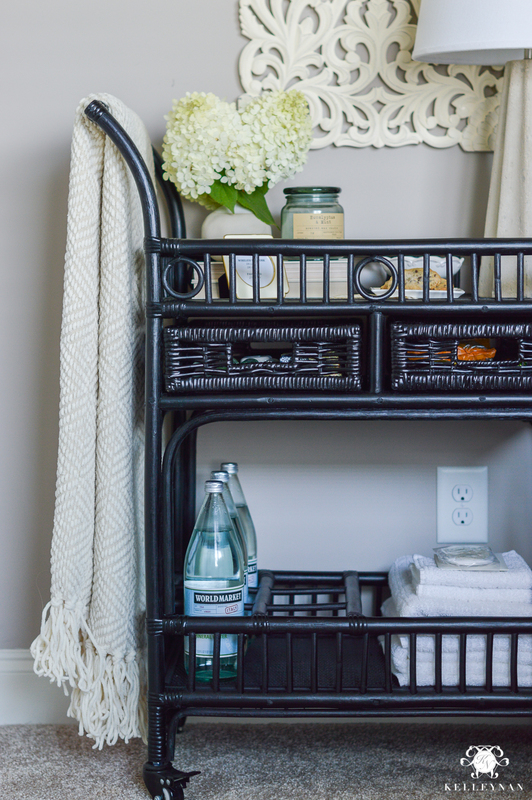 Use a bar cart as a side table. Or, a night stand. Or, a plant stand. Having it in lieu of another piece of furniture is 1. probably more cost effective and you’ll love being able to bring it out when you have friends over. I literally use mine all over the house for everything. This will save you major $$$. I used to think any indoor/outdoor rug would basically feel like astroturf. Not true. 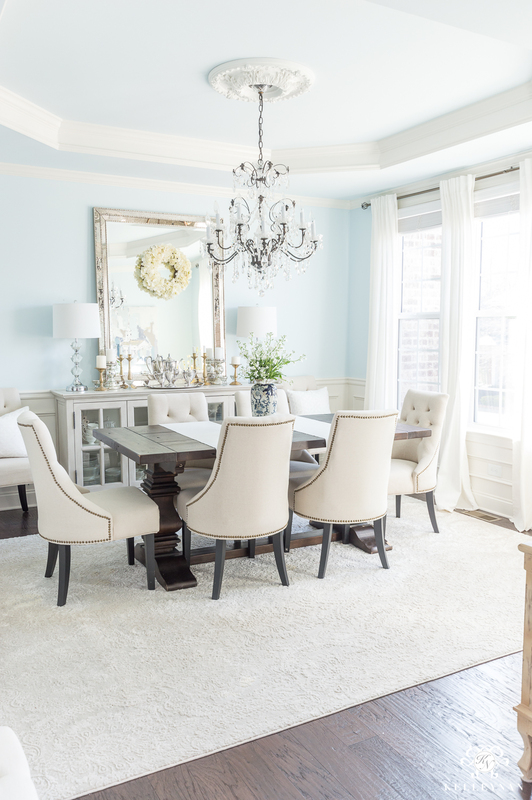 With more people focusing on outdoor living and creating an area that is an extension of what’s going on inside, there are some really good rugs that don’t even look like they aren’t indoor exclusive. As a bonus, I remember being 22 and the kind of parties I had were a little different than today (haha). Indoor/outdoor rugs clean up so well, making it a super smart choice if you like to entertain. And this is what it looked like after an hour or so. Check the mechanics of the piece (do the drawers glide smoothly?) and if you aren’t super handy and don’t want to mess with wood filler, confirm there aren’t huge chunks/gashes missing. Aside from that, you can get totally creative and outfit your space exactly how you want for a super low price. 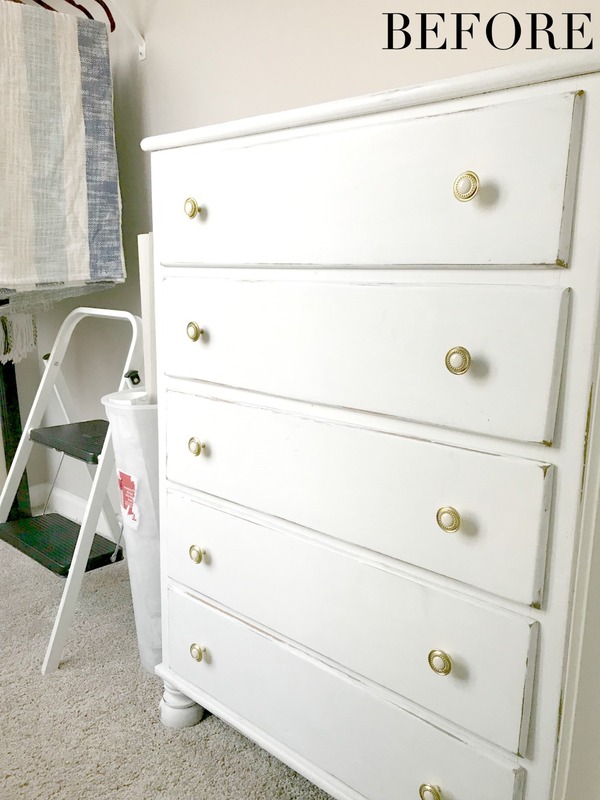 You can find my easy chalk painting tutorial (no prep needed) HERE and the chest of drawers closet makeover project HERE. If you do fall into the category of being young, budget conscious and/or not in your “forever” home, I would look for an inexpensive, neutral sofa. Here’s why. Your tastes are going to change, your financial situation will likely evolve, and how much are you lounging on the sofa? When I wasn’t with friends, I was primarily watching TV from bed. Regardless, as you do move, your space constraints will likely dictate a sofa of a different size. No matter how much you tell yourself that you will find a way for the fuchsia love seat to work in your homes for years to come to justify an expensive/trendy purchase, my guess is that you’ll be out a lot of money and wanting something different by the time you move out. 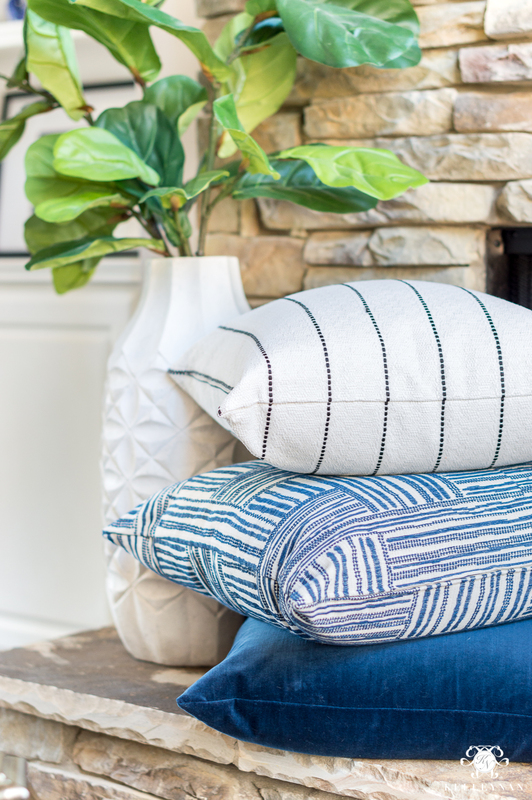 Focus on making a statement through throw pillows, instead. Seriously, throw pillows (and throw blankets) can take a sofa you detest to something you actually like. And, it will be original. If you get tired of throw pillows, you can move them around – at worst, be out $30 instead of $2,000. 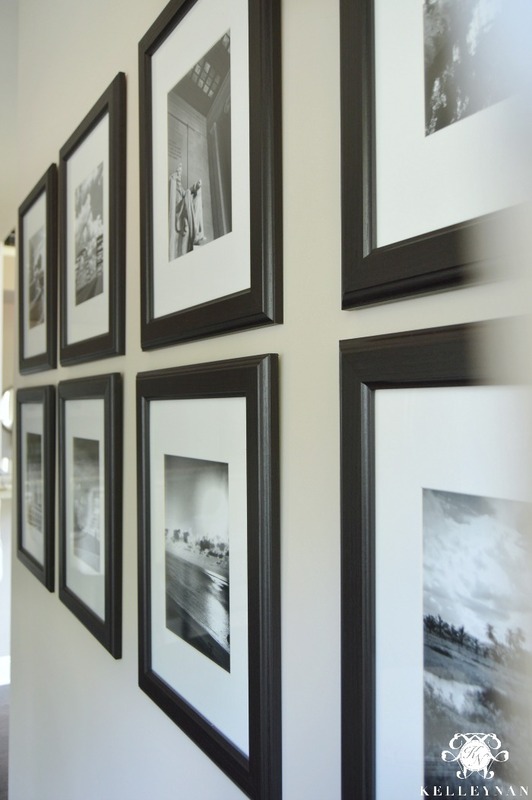 or frame your personal experiences like I did with this black and white gallery wall of travels (see the full post, along with other gallery wall ideas HERE). During the time you are in your first apartment is typically when you’re finding out a lot about yourself. And, you’re finding out what your tastes are. 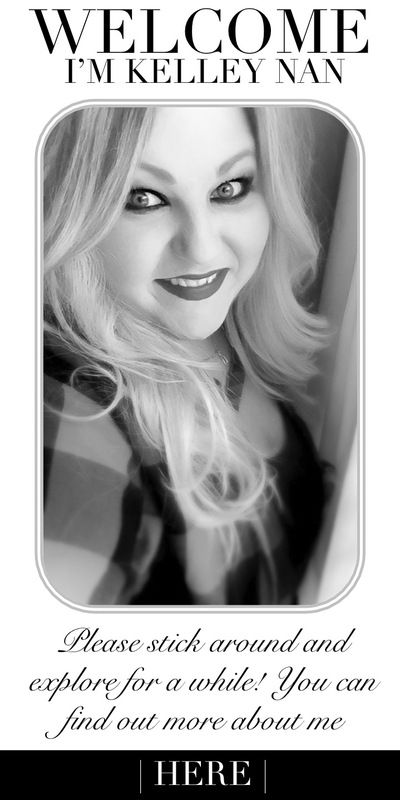 Contrary to what I thought, creating a space that’s a “refection of you” doesn’t always mean the polar opposite of what you’ve always known, just because you can haha. Orange and brown followed me for a long time just because it was the so far from what I grew up with. (Is decorating rebellion a thing?!) Take your time, don’t spend your rent money on expensive trends, find ways to be resourceful, and enjoy making your place a home you love. Not every space has to be your ultimate dream space, especially when you’re starting out. Learn to compromise, and identify your priorities. Collect ideas on Pinterest – don’t try to replicate the rooms; instead, determine what you like about them and use them as inspiration. And of course, I hope if you don’t already, you’ll subscribe to my emails at the bottom of this post and visit me for ideas along the way. Lacey, I totally get it!! Thank you so much for stopping by! Always love your posts, Kelley! Your have a gift for pairing lovely design with practical purchases. I often have problems opening the links to the items, however. Is it just the two wacky laptops I’m using, or has anyone else mentioned troubles getting them to open? Hi, Sharon! You are so sweet to me. And how frustrating- I am so sorry! I haven’t heard of anyone else having any issues but I will definitely reach out to see if this is a known issue; thank you for letting me know!